Assess in situ the effects of high-concentration hydrogen peroxide with and without fluoride on human dental enamel using the ion chromatography test (IC) and the Knoop hardness test (KHN). Nineteen enamel specimens were prepared using third human molars. These specimens were fixed on molars of volunteers and were divided into groups: OP38-Opalescence Boost PF38%, PO37-Pola Office 37.5% and CO-Control group. For chemical analysis (n= 3), the dentin layer was removed, keeping only the enamel, which was subjected to acidic digestion by microwave radiation. It was necessary to perform sample dilutions for the elements fluorine (F), calcium (Ca) and phosphorus (P) for quantification using the IC test. The KHN (n= 5) was performed before and after the treatments. Five indentations were made, separated by 100 µm, for each specimen using a load of 25 gf for 5 seconds in the microdurometer. The data were analyzed using ANOVA with a 5% significance level. The OP38 group had the largest concentrations of F, Ca and P ions. The PO37 group showed the lowest concentrations of F and Ca ions. The average KHN was not significantly different between the OP38 and PO37 groups. Enamel whitened with hydrogen peroxide containing fluoride had greater concentrations of F, Ca and P ions. The presence of fluoride in the whitening agent did not influence the enamel microhardness. Keywords: Dental whitening, Fluoride, Hydrogen peroxide, Microhardness, Peroxides, Whitening agent. Dental whitening has been increasingly sought out to improve dental aesthetics, as the procedure produces good results in the short term. For this reason, new whitening techniques have been developed and optimized to increase their effectiveness in removing stains, whether intrinsic or extraneous [1, 2]. Whitening agents, such as hydrogen peroxide (HP) and carbamide peroxide (CP), have been widely used because they are effective, low cost, conservative treatments . High-concentration HP is used in dental clinics and is the treatment of choice for patients who do not adapt well to homemade whitening treatments, either because they are unable to use a whitening mouthpiece or because they wish for the more immediate results provided by high-concentration HP . The mechanism of action for HP is based on the oxidation caused by the release of oxygen, which seeps through the pores present in the enamel prisms and reaches the dentin, breaking up organic molecules and yielding smaller compounds that are clearer and lighter . Although dental whitening is effective, some studies report secondary clinical effects, such as gum irritation, dental hypersensitivity [5-7], and chemical and morphological changes in dental enamel surfaces subjected to different whitening techniques [2, 8-11]. High-concentration HP can cause clear microscopic changes, such as increased porosity, depression, surface irregularities , greater roughness, and lower microhardness . Laboratory studies have revealed a reduction in the hardness of enamel whitened with high-concentration HP [14, 15], demonstrating that 35% HP qualitatively affects human dental enamel morphology . China et al. observed an in vitro increase in the hardness of bovine enamel whitened with 35%HP followed by topical application of fluoride. It has been recommended that fluoride be combined with dental whitening to reduce the side effects of this treatment on dental structure. In vitro studies have reported that specimens subjected to whitening with high-concentration HP combined with fluorine featured fewer deleterious effects on the enamel surface after treatment [17-19]. However, in vitro studies have some limitations when compared to clinical and in situ studies because under laboratory conditions, there is no way to faithfully reproduce the oral conditions found in vivo, such as salivary flow, buffering capacity of saliva, oral hygiene and topical use of fluorides, which contribute to the remineralization of whitened enamel [20, 21]. This study aims to assess in situ the effects of fluorinated and non-fluoridated high-concentration whitening agents on human dental enamel through the ion chromatography test (IC) and the Knoop hardness test (KHN). This work was reviewed and approved (protocol number 188,682) by the Ethics Committee of the Institute of Health Sciences, Federal University of Para (UFPA), Brazil. The teeth used in this study were donated by patients after signing an informed consent document. A total of 19 erupted third molars without cracks and stains were selected. The teeth were cleaned and stored in distilled water until specimen preparation. Each tooth was sectioned transversally across the crown/root border, along the amelocemental junction, using a 4138 diamond drill bit (KG Sorensen, Sao Paulo, Brazil) under air/water cooling. The crowns were selected for the experiment, and the roots were discarded. The vestibular surfaces of the crowns were cut with a steel double-sided disk (KG Sorensen, Sao Paulo, Brazil) driven by a micromotor at low rpm (Atlantian Dhabi, Sao Paulo, Brazil) under water cooling to avoid burning the dental tissue and were standardized with number 4138 diamond tips (KG Sorensen, Sao Paulo, Brazil), yielding 19 specimens measuring 3mm X 3mm x 3mm. The trimmed portion always corresponded to the central area of the vestibular crown surface to obtain enamel prisms with similar slopes. The planning of surfaces from the specimens obtained was achieved with wet sandpaper at 400, 600 and 1200 grain, successively, under running water. Next, the enamel was polished on an APL-4 polisher (AROTEC Ltda, Sao Paulo, Brazil) with a felt disk combined with aluminum paste (Alpha Micropolishâ 10-Union Carbide, Greensburg, LA). The dental fragments were stored in distilled water until use. A total of 5 volunteers, students of the Faculty of Dentistry at the Federal University of Para (UFPA), aged between 20 and 22 years, who met the inclusion and exclusion criteria shown in Table 1, were selected for the study. The volunteers were informed about the study procedures and signed an informed consent document. For the volunteers to exhibit similar salivation patterns, during the selection, the pH and salivary flow of all participants were standardized. Table 1. Criteria for volunteer selection. Saliva collection was performed following the spitting method through mechanical stimulation with a sterile piece of latex for six minutes according to the methodology recommended by Navazesh . Values were obtained for the speed of salivary flow through the gravimetric method described by Banderas-Tarabay et al. , and the salivary pH values of the volunteers were determined using a pH meter (Omega-Sao Paulo, Brazil) with a glass microelectrode previously calibrated with pH 4.0 and 7.0 standard solutions. Volunteers who produced a neutral salivary pH (pH = 7) and salivary flow speeds above 0.7 mL/min, considered a normal value according to the literature , were accepted to participate in this study. To fix specimens on dental elements of the study volunteers, the adhesive system Adapter Single Bond 2 (3M/ESPE, Sao Paulo, Brazil) and the binding agent RelyX ARC (3M/ESPE, Sao Paulo, Brazil) were used. These materials were photopolymerized using an LED light source (Radii, SDI Limited, Bayswater, Victoria, Australia) on the vestibular surfaces of the upper and lower first molars according to the methodology described by Faraoni et al. . All materials used were handled according to the manufacturers’ guidelines. The specimens and volunteers were divided into three experimental groups according to the whitening agent used and whitening protocol performed (Table 2). The application of whitening agents followed the manufacturers’ recommendations (Fig. 1); their compositions are described in Table 2. Table 2. Experimental groups and the manufacturers and compositions of the whitening agents used. OP38 Opalescence Boost PF 38% / Ultradent Products, South Jordan, UT, USA. Hydrogen peroxide 38%, potassium nitrate and fluoride. 2 X 15 min/day, 1 session/week, for 3 weeks. PO37 Pola Office 37.5% / SDI Limited, Bayswater, Victoria, Australia. Hydrogen peroxide 37.5%, additives, glycerol, water and aromas. 30 min/day, 1 session/week, for 3 weeks. (CONTROL) - - Without treatment. After conducting the whitening treatments, surfaces were polished using a felt disk coupled to a low-rpm drill using universal polishing paste (FGM, Santa Catarina, Brazil). The volunteers received Even baby toothpaste without fluoride (Even, Pernambuco, Brazil) for oral hygiene during the whitening treatment. 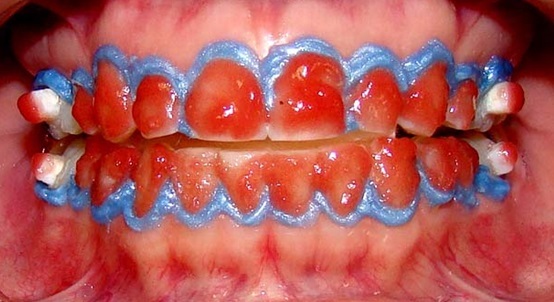 After whitening, the specimens were removed with pliers for removing orthodontic brackets (Quinelato, Sao Paulo, Brazil) and were taken to the laboratory for analysis. Chemical quantification analyses were performed on three specimens for each group (n= 3). The dentin layer of the specimens was removed with a 4138 diamond tip (KG Sorensen, Sao Paulo, Brazil) coupled to a high-rpm motor (Atlantian Dhabi, Sao Paulo, Brazil) under a cooler. Only the enamel was left, which was then ground, autoclaved and subjected to acidic digestion by microwave radiation (MarsXpress-CEM, Sao Paulo, Brazil). The samples were digested in polytetrafluoroethylene (Teflon®) vials previously decontaminated in nitric acid (HNO3, 1% v/v) and were then washed with distilled and deionized water. Digestion by microwave was performed using approximately 0.1 grams of mass sample, 3 mL of nitric acid (HNO3) (Conc. ), 1 mL of hydrochloric acid (HCl) (Comp.) and 1mL of HP (H2O2), after which the samples were taken to the microwave. The samples were transferred to polyethylene bottles with a final volume of 50 mL. Sample dilution (303x) was performed for the quantification of the chemical elements fluorine (F), calcium (Ca) and phosphorus (P) on an ion chromatograph (ICS2000DUAL, DIONEX, USA). The levels of chemical elements expressed by IC were in percentages (%), where 1% equaled 10,000 µg/g (ppm). Fig. (1). Dental bleaching with opalescence boost PF 38%. Five specimens were used per experimental group (n= 5). Five indentations were conducted in each specimen and were separated by 100 µm using a load of 25 gf for 5 seconds on the microdurometer (FM-700, Future Tech Corp., Tokyo, Japan). Five readings were taken before whitening (KHN initial) and immediately after the last whitening session (KHN final). Where KHN (I) is the average initial microhardness and KHN (F) is the average final microhardness. The KHN data were tabulated in the statistical software BioEstat 5.0 (Instituto de Desenvolvimento Sustentável Mamirauá, Amazonas, Brazil) with a 5% significance level using ANOVA. For IC, a descriptive analysis of the data was performed. The OP38 group showed higher values for the concentrations of F, Ca and P ions, while the PO37 group had lower concentrations of F and Ca ions than the CO group (without treatment), as shown in Table 3. Table 3. Percentages of F, Ca and P ions present in the samples. Table 4 shows that there were no statistically significant differences between the average initial and final KHN values of the experimental groups. The OP38 and PO37 groups showed increases in their KHN values at the end of whitening treatment. Table 4. Averages and standard deviations of the initial and final values for Knoop microhardness (KHN) and percentages of microhardness. *Groups with the same letters are statistically similar (uppercase letters in columns and lowercase letters in rows). To decrease the deleterious effects of dental whitening on enamel, fluoride has been added to high-concentration whitening agents. The addition of F and Ca ions to these products is intended to increase the deposition of hydroxyapatite crystals and to slow the dissolution of minerals from human dental enamel [26, 27]. The results of this research indicate greater concentrations F, Ca and P ions in human dental enamel samples treated with a high-concentration whitening agent with fluoride in its composition. The whitening agent without fluoride showed lower values for F and Ca ions than the control group. IC is a chemical analysis based on the phenomenon of ionic exchange. When combined with detection of conductivity and chemical suppression, IC makes it possible to measure the amounts of ions in the dental enamel . This test has enabled observations of the ionic profiles of human dental enamel subjected to different treatments. The whitening agent with added fluoride with salivary action may have positively contributed to the increases in F, Ca and P ions in the OP38 group. In vitro studies have shown significant reductions of mineral compounds in enamel after whitening [3, 15, 29]. However, in the present study, the PO37 group showed only slight reductions of F and Ca ions, while P ions increased even in the absence of fluorine, a phenomenon that can be explained by the remineralizing capacity of saliva, which includes Ca and P ions in its composition . Analyzing the KHN of dental enamel revealed that the average KHN values obtained in this study for the different experimental groups did not differ significantly, indicating that fluorine combined with HP did not affect the hardness of human dental enamel subjected to whitening treatment. This result can be attributed to the low concentration of fluoride (1.1%) contained in the formulation of the product used, as reported by the product manufacturer. An in vitro study  found that specimens whitened with 35% HP containing 2% fluorine showed a significant increase in the KHN value when compared to specimens whitened using HP without fluorine, showing that the concentration of fluoride can influence the KHN of whitened enamel. The PO37 group showed no significant change in the average KHN after whitening treatment, corroborating the results of Sa et al. , who did not find a significant difference between the KHN values of specimens before and after whitening treatments with high-concentration HP. This result can also be attributed to the protective effect of saliva, which is able to avoid deleterious effects on the chemical structure and mechanical properties of enamel due to its capacities for buffering, dilution and supplying Ca and P for dental remineralization . New studies aimed at the variation of fluoride concentration associated with bleaching agents are necessary to elucidate the risks and benefits of the action of these products on dental enamel. According to the results found in this study, we conclude that enamel whitened with HP with fluoride featured greater concentrations of F, Ca and P ions. The presence of fluoride in the whitening agent was not able to influence the microhardness of enamel. The authors would like to thank FAPESPA (Fundação Amazônia Paraense de Amaro a Pesquisa) and the Federal University of Para for financing the research. Basting RT, Rodrigues AL, Serra MC. Micromorphology and surface roughness of sound and demineralized enamel and dentin bleached with a 10% carbamide peroxide bleaching agent. Am J Dent 2007; 20(2): 97-102. Cavalli V, Giannini M, Carvalho RM. Effect of carbamide peroxide bleaching agents on tensile strength of human enamel. Dent Mater 2004; 20(8): 733-9. Marson FC, Sensi LG, Vieira LC, Araújo E. Clinical evaluation of in-office dental bleaching treatments with and without the use of light-activation sources. Oper Dent 2008; 33(1): 15-22. Tredwin CJ, Naik S, Lewis NJ, Scully C. Hydrogen peroxide tooth-whitening (bleaching) products: review of adverse effects and safety issues. Br Dent J 2006; 200(7): 371-6. Hannig C, Lindner D, Attin T. Efficacy and tolerability of two home bleaching systems having different peroxide delivery. Clin Oral Investig 2007; 11(4): 321-9. Martin J, Fernandez E, Bahamondes V, et al. Dentin hypersensitivity after teeth bleaching with in-office systems. Randomized clinical trial. Am J Dent 2013; 26(1): 10-4.
 da Silva AP, de Oliveira R, Cavalli V, Arrais CA, Giannini M, de Carvalho RM. Effect of peroxide-based bleaching agents on enamel ultimate tensile strength. Oper Dent 2005; 30(3): 318-24. Bistey T, Nagy IP, Simó A, Hegedus C. In vitro FT-IR study of the effects of hydrogen peroxide on superficial tooth enamel. J Dent 2007; 35(4): 325-30. Zantner C, Beheim-Schwarzbach N, Neumann K, Kielbassa AM. Surface microhardness of enamel after different home bleaching procedures. Dent Mater 2007; 23(2): 243-50. Ferreira SdaS, Araújo JL, Morhy ON, Tapety CM, Youssef MN, Sobral MA. The effect of fluoride therapies on the morphology of bleached human dental enamel. Microsc Res Tech 2011; 74(6): 512-6. Borges AB, Samezima LY, Fonseca LP, Yui KC, Borges AL, Torres CR. Influence of potentially remineralizing agents on bleached enamel microhardness. Oper Dent 2009; 34(5): 593-7. Ulukapi H. Effect of different bleaching techniques on enamel surface microhardness. Quintessence Int 2007; 38(4): e201-5. Al-Salehi SK, Wood DJ, Hatton PV. The effect of 24h non-stop hydrogen peroxide concentration on bovine enamel and dentine mineral content and microhardness. J Dent 2007; 35(11): 845-50. China AL, Souza NM, Gomes YdoS, Alexandrino LD, Silva CM. Effect of fluoride gels on microhardness and surface roughness of bleached enamel. Open Dent J 2014; 8(8): 188-93. Martin JM, de Almeida JB, Rosa EA, et al. Effect of fluoride therapies on the surface roughness of human enamel exposed to bleaching agents. Quintessence Int 2010; 41(1): 71-8. Dominguez JA, Bittencourt B, Michel M, Sabino N, Gomes JC, Gomes OM. Ultrastructural evaluation of enamel after dental bleaching associated with fluoride. Microsc Res Tech 2012; 75(8): 1093-8. Featherstone JD, O’Really MM, Shariati M, Brugler S. Enhancement of remineralization in vitro and in vivo. In: Leach AS, Ed. Factors relating to demineralization and remineralization of the teeth. Oxford, England: IRL 1986; pp. 23-34. Navazesh M. Method for collecting saliva 1993; 694: 72-7. Banderas-Tarabay JA, González-Begné M, Sánchez-Garduño M, Millán-Cortéz E, López-Rodríguez A, Vilchis-Velázquez A. The flow and concentration of proteins in human whole saliva. Salud Publica Mex 1997; 39(5): 433-41.
 von Bültzingslöwen I, Sollecito TP, Fox PC, et al. Salivary dysfunction associated with systemic diseases: systematic review and clinical management recommendations. Oral Surg Oral Med Oral Pathol Oral Radiol Endod 2007; 103(S57)(Suppl. ): 57.e1-57.e15. Faraoni-Romano JJ, Turssi CP, Serra MC. Effect of a 10% carbamide peroxide on wear resistance of enamel and dentine: in situ study. J Dent 2009; 37(4): 273-8. White WD, Nancollas GH. A rotating disc study of enamel dissolution in HEDP solution under simulated white spot conditions. J Dent Res 1980; 59(7): 1180-6. Bizhang M, Seemann R, Duve G, et al. Demineralization effects of 2 bleaching procedures on enamel surfaces with and without post-treatment fluoride application. Oper Dent 2006; 31(6): 705-9. Frankenberger WT, Mehra HC, Gjerde DT. Environmental applications of ion chromatography. J Chromatogr A 1990; 504: 211-45. Souza RO, Lombardo GH, Pereira SM, et al. Analysis of tooth enamel after excessive bleaching: a study using scanning electron microscopy and energy dispersive x-ray spectroscopy. Int J Prosthodont 2010; 23(1): 29-32. Nascimento WC, Gomes YdoS, Alexandrino LD, Costi HT, Silva JO Jr, Silva CM. Influence of fluoride concentration and pH Value of 35% hydrogen peroxide on the hardness, roughness and morphology of bovine enamel. J Contemp Dent Pract 2014; 15(4): 392-8. Sa Y, Sun L, Wang Z, et al. Effects of two in-office bleaching agents with different pH on the structure of human enamel: an in situ and in vitro study. Oper Dent 2013; 38(1): 100-10. Diaz-Arnold AM, Marek CA. The impact of saliva on patient care: A literature review. J Prosthet Dent 2002; 88(3): 337-43.